Sutter’s Lambda LS is a stand-alone lighting system that is provided with a xenon-arc lamp, cold mirror, lamp housing, and power supply in a single enclosure. 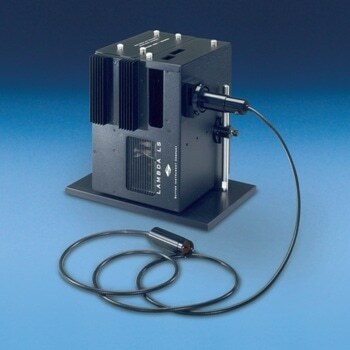 The system is designed to be used with a liquid light guide that emits extremely flat, intense, illumination to the optical train of the user’s microscope or other instrumentation. The Lambda LS cabinet houses a basic Sutter Instrument filter wheel with shutter that can slide easily in and out of a slot in the light path. If required, a second filterwheel can be mounted on the outer side of the cabinet. When used with suitable adapters, the light guide output can be matched with most common microscope systems. In contrast to the arc lamps used with most fluorescence microscopes, the xenon bulb is pre-aligned using a parabolic mirror and does not need alignment. In the standard configuration, the Lambda LS bulb can produce light output from 340 nm to a cutoff of 700 nm determined by the cold mirror. An optional enhanced UV bulb produces output much lower into the UV (cut off near 200 nm). As with any UV producing light source, the optional bulb generates considerable quantities of ozone and should be used in a adequately ventilated environment. The Lambda LS has a compact design, and comprises of lamp house, power supply, arc lamp, and cold mirror in a single enclosure. This system eliminates a common failure related with basic arc lamp designs: when using a remote power supply aging may result in a reduced ability to light the lamp due to loss of the insulating properties of the lengthy high-tension line. As with all Sutter’s equipment, the power supply has been designed to reduce electrical noise that can be picked up by physiological recording equipment.